Inspiration for a blog post can hit at any time. My latest hit was while I was working on the volume seven interactive catalog. I was going through checking links, business per usual, and entered in item number G11441 for a seemingly plain rusty scrapple pan. You might look at that and think, “Ok, cool. What do you want me to do with that? !” I can’t blame you because that was my same thought! Then I saw the pictures on the site and said, “Duh! Why didn’t I think of that?! !” Maybe it was too early and my creativity just wasn’t flowing yet. Yep, that is my reasoning and I am sticking to it! Gorgeous, right? And perfect for fall. Luminaras are great; I love the faux flame that waves just like the real thing! The orange luminara with the bittersweet wreath is a perfect match! I can definitely see why bittersweet is a customer favorite and a KP Creek best-seller! 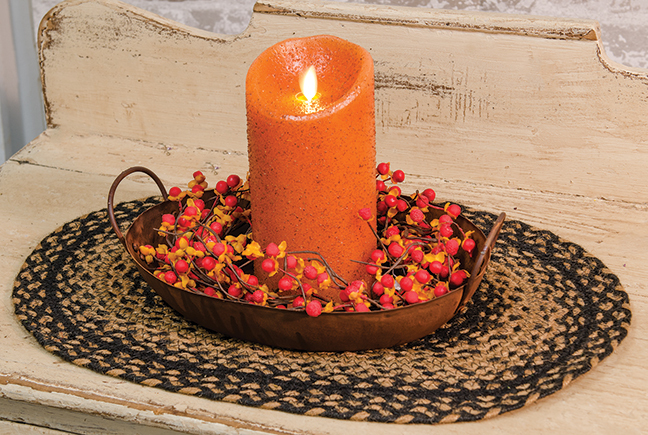 Add a final touch to the centerpiece by resting it on a placemat. 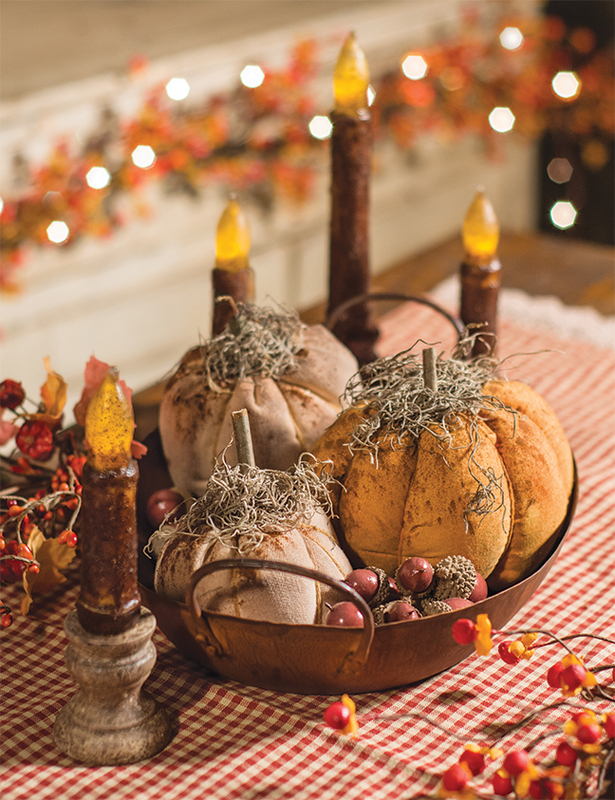 Throw in some ivory and orange primitive plush pumpkins that are dusted with cinnamon and you will achieve a unique country fall centerpiece. To fill the pan up even more, nestle acorns in the open spaces. For added warmth, surround the pan with tapers in candle holders. Set this on top of a tan and red checkered table runner and complete the primitive country look! So, rusty scrapple candle display or country pumpkin holder? 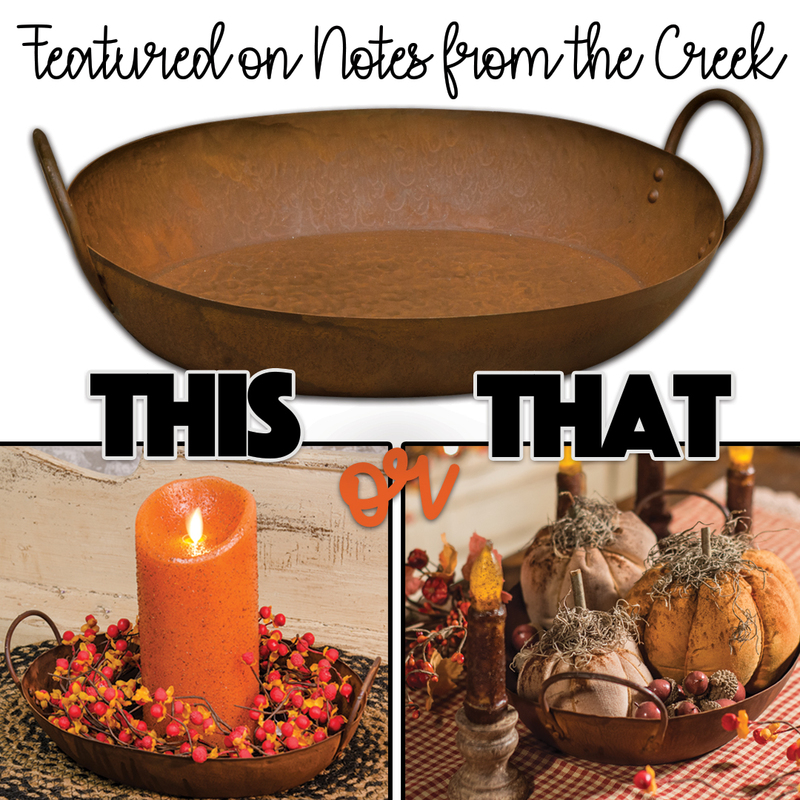 Tell us your favorite centerpiece and what you like best about it! I am so sad. I have requested a catalog 2 times but never received one. I have bought alot of things from you but preferred catalog shopping not on catalog. Please could you please put me back on your catalog mail list. I see several things I would like to purchase from you but was recently forced to buy diseases. Barbara Burton, 104 Martindale Court, Clifton Park, MY 12065 thank you. Hi Barbara! I have passed your address on to customer service. A catalog will be mailed to you today! Let us know when you get it!